My shoulders felt like cement, my legs had gone to sleep and my hands were stiff and soggy. It had been an effort to stay awake at times, my brain and body tired after nearly twelve hours in Nelson, paddling and concentrating, willing Japan to come closer. As shadowy hills morphed into greens, kissed with the gold of the afternoon sun, and hilltop pillars became turbines turning slowly in the wind and boxes became buildings with windows and doors, I grinned and whooped and hollered and sang. Then I would yawn and fight back the sleep monsters, falling silent again as I checked in with each bit of my body to focus in on the last couple of miles. ‘Come. On. Outs.’ I shouted to myself through gritted teeth as I pulled Nelson and I through the waves, pedalling my feet in turn against the footplate, encouraging every bit of my body to help bring us home. I was happy to land in Japan for so many reasons. 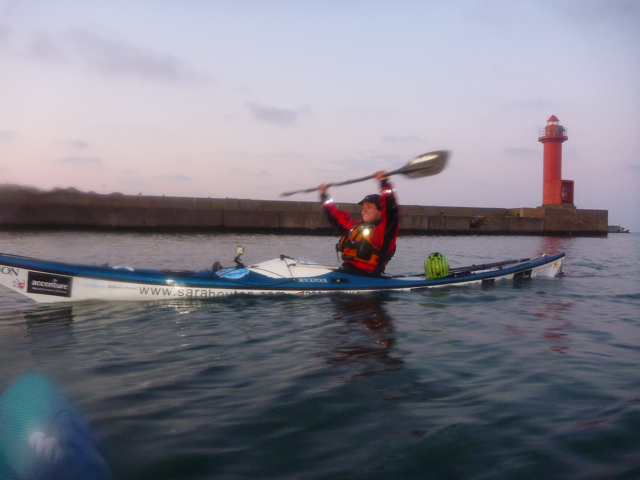 First off, I needed to pee – going to the loo in a kayak is no easy maneouvre. Secondly, the pressure of recent weeks was now gone – the logistics from here on in much simpler and the time issues of visas for my team dissolved. 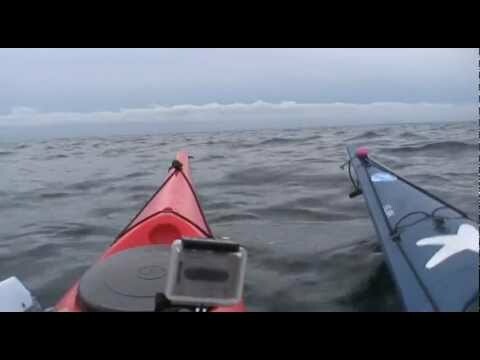 Finally, I was happy because I had proved myself to myself in the final few days of paddling down Sakhalin, having found the initial return to kayaking so alien on my first few days from mainland Russia. After a day of sleeping and snoozing and sorting my kit, I am now returning to Hercules (no doubt champing at the bit ), complete with a new flag to start cycling south. There is another day or two of kayaking at the other end of the island to get to Honshu, and then I can really kick back and relax. Tim and Justine will fly home and leave me to cycle to Tokyo and then on to Choshi, from where I start my Pacific row next spring, but there is no time pressure – Hercules and I can take our time. Happy days indeed on this side of the world. PS Thank you to the CIQ officials who came out to visit us at Cape Soya, making our entry to Japan very smooth indeed, and to Mr Sato from Wakkanai Town Hall who welcomed us with a banner and flowers. Thanks also to Mr Ito for organizing logistics on this side and, everyone who helped us on Sakhalin, especially Alex Yemchenko. Thanks as well to Karel Vissel for sending us daily weather reports. PPS Thanks for all the lovely messages recently, especially through the tough patches on Sakhalin. When you are cold and wet and having a down moment in a tent, some banter and encouragement from afar can work wonders. Happy to report that I am now very much back in the groove and somewhat more refreshed ,too. PPPPS Congratulations to my friend Roz Savage who, last week, landed safely in Mauritius after rowing solo across the Indian Ocean. She is the first woman to row the three oceans – Atlantic, Pacific and Indian. What a stunning way to arrive in the tip of Japan…! Your journey now begins once again…! Take your time through Hokkaido and Honshu and plenty of time for Tokyo…! Whew! so glad you made it to Japan! Looking forward to more posts about how Japan is treating you. 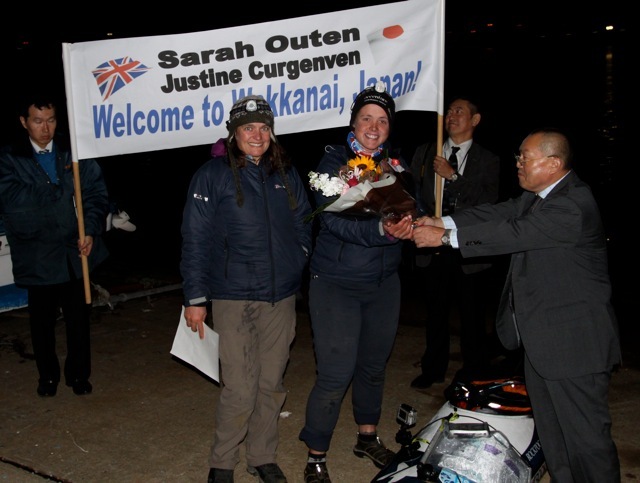 Another big tick Sarah – enjoy Japan and your preparations for the Spring. You are as inspiring as ever! So nice to see you both happy, smily and safe in Japan! And so nice to see such a warm and welcoming Japanese people! Well done Sarah, amazing! I have been following your blogs and videos all the way. I love it when your e mails pop up and I can get away from some of the very boring, mundane stuff that I deal with and read about the next section of your journey. Congratulations! Doesn’t seem all that long ago we were having a pizza in sunny Rutland… and now you’re in Japan having got there entirely under human power! Sarah – well done , what a relief after what appears to have been a gruelling few days and weeks. Enjoy Japan and the more relaxed pace you can set yourself. We feel like we need a rest too! We are all following you avidly and enjoying every moment with you. Huge relief and a great effort. Now you can enjoy the journey without deadline worries. Happy Herculesing Sarah! Another of many hard-fought victories………..and she acknowledges the triumph of another. You are truly a classy lady. Success will come to you. Congratulations on reaching Japan! That’s a huge milestone to reach and such a relief to have got there in one piece. You are doing so well – hope Japan treats you well. Liked the music at the end of the video!!! Just had a quick look at your entrance into Japan video. Why because I just heard from my mate Lincoln that your coming to stay for a while just down the road and sent me a link to your facebook. So i thought Id send you a quick note to let you know, that if you need anything just give me a call, you will be just minutes down the road. Maybe come to dinner sometime. Hope you have fun in Japan, talk to you soon.